If you are interested in buying some good Jazz CDs to start a collection, here are 12 that I would recommend. This would give you a pretty solid foundation and allow to figure out what you like the most and how to get familiar with some artists. I have some tips about buying specific artists elsewhere (click here). Since this is only my opinion, take it with a grain of salt. If you want some tips on sampling jazz (such as these) click here. You can click on the hyper linked names to read more about the artist. However, I haven't completed them all. (If the background isn't black, it isn't finished) You will need to use the "back" button on your web browser to return here. 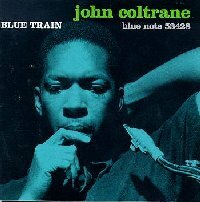 John Coltrane - Blue Train (Blue Note). Excellent music. Coltrane put out many superb CDs, but in my opinion, this is one of the most "user friendly" as far as listening to. Unlike his later works, where Coltrane does most of the soloing, this features a 3 horn "front line", with Curtis Fuller (Trombone) and Lee Morgan (Trumpet), also. Also joining him are Kenny Drew (piano), Paul Chambers (bass), and "Philly" Joe Jones (drums). If you like classic jazz, this is a doozie. If you like really mellow music, he does do a ballad on here, but perhaps you would prefer his CD The Gentle Side of John Coltrane. 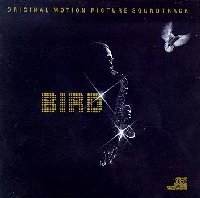 Charlie Parker - Bird Original Motion Picture Soundtrack (Columbia). No jazz collection is complete without Charlie Parker. However, he recorded back in a time before stereo technology, so the sound quality isn't what a beginner is used to. In the productions of this CD, all other instruments were filtered out, except Parker, and great jazz musicians were brought in to record the rest of the parts. The result is stereo quality, but with every solo being pure Parker (since nobody could match his style!) This also has a variety of styles, from the ultra intense lead-off song, Lester Leaps In, to the mellow Laura, recorded with a string orchestra accompanying. Once you get hooked onto this, then you are rooted and can expand out into other Parker CDs. It's hard to go wrong with him, but because of the sound quality of this CD, it's one I highly recommend to start with. 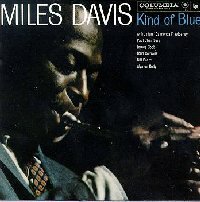 Miles Davis - Kind of Blue (Columbia). It just doesn't get much better than this! The mood is relaxed but the solos are incredible. This is one of the biggest selling and most influential jazz recordings of all time. When the annals of 20th century music are studied someday, this recording will be near the top, regardless of genre. It features excellent musicians, such as John Coltrane, Cannonball Adderly, Bill Evans, and Paul Chambers. Miles made a lot of superior recordings and at least 3 of them changed the direction of jazz (this being one of them), but in my opinion, this was the pinnacle of his recording career and the best group that he ever formed. 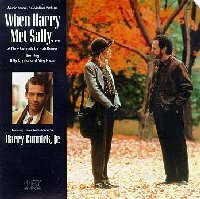 Harry Connick, Jr -- When Harry Met Sally Original Motion Picture Soundtrack (Columbia). 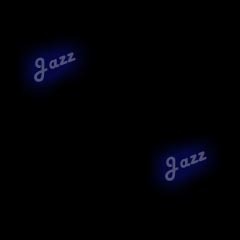 This is a collection of classic jazz songs. Many are big band/swing with Harry singing. Some of them are smaller groups, with Harry playing the piano and/or singing. If you like this, and you want to buy more of this style from him, don't buy just any CD by him. He has a variety of styles. Blue Light Red Light and We are in Love are this style. She and Star Turtle have a lot of funk in them and I wouldn't recommend either. 20 and 25 are he and a piano, singing and doing classics. The rest are small group sessions with no vocals. 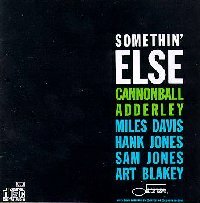 Cannonball Adderly - Somethin' Else (Blue Note). Adderly was one of the more bluesy saxophone players and he really puts his heart into the music on this album. Actually, he does on a lot of other albums, but this CD is very, very good. He and Miles Davis have a lot of excellent chemistry on this. If you like Miles' Kind of Blue (listed above), you will probably like this as well. 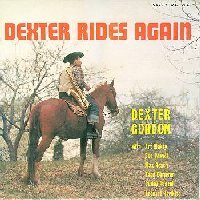 Dexter Gordon - Dexter Rides Again (Savoy). If you like your classic quintet jazz, this is an excellent buy! This music is so ... fun! If you listen to it, go to the title track first and you'll see why I flipped when I heard this for the first time! If you like this, you will like just about anything else that Dexter Gordon did. 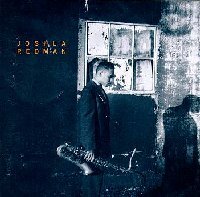 Joshua Redman - Joshua Redman (Warner Bros). It's actually hard to pick one of his CDs over the others, because they are all so good! This has a nice mix of original songs (that are superb!) and classics. He does slow songs, fast songs, happy songs, blues, just a great mix. Redman is an excellent young tenor sax player. If you like this, check out some of his other CDs. I really liked Freedom in the Groove by him, as well. 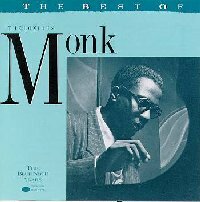 Thelonious Monk - The Best of Thelonious Monk (Blue Note). Monk was a bizarre guy and a brilliant musician and composer. His piano playing is unlike any that you have ever heard, and you don't have to be a trained pianist to hear this. He used chords that sounded like he hit the wrong note and worked them into his songs, and makes them fit! He isn't covering up an error -- he was a master at using unconventional chords in his songs. His songs also have something unique to them. It's hard to describe, but when you hear it, you know it's just ... different, yet cool. His music always gets a positive response when I play it for others. It just seems that his unusual style strikes a chord deep within folks. In my opinion, this is the best collection of Monk, and it features nearly all of his classics, many of which became jazz standards. If you are in the mood for a piano player who will impress you more with speed and technical brilliance, then check out Art Tatum (anything) or Oscar Peterson. I have some of their works in my top 30. Diana Krall - All for you (A tribute to the Nat "King" Cole trio) (Impulse). If you like vocals, this is worth checking out. To me, this is your classic "dim lit jazz club music." Her trio has excellent chemistry and they do a wide range of songs, from fast and chirpy to slow and bluesy. She has a sultry voice and sings with a lot of emotion. I loan this CD out to a lot of my non-jazz friends and the response is always positive. 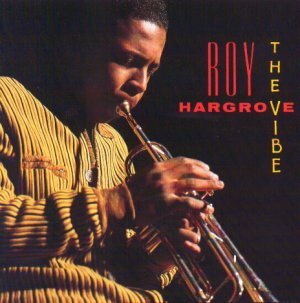 Roy Hargrove - The Vibe (Novus). This is a CD I have been listening to a lot lately. It's fabulous! Hargrove is a fantastic young trumpet player who plays fast, slow, and with a lot of feel -- very well rounded. His sax player, Antonio Maurice Hart, compliments him well -- his solos are what actually made me take notice, and then shortly afterward, I was saying "Wow!" to Hargrove's solos as well. 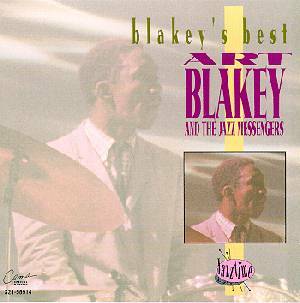 Art Blakey and the Jazz Messengers - Blakey's Best (Jazztime). Don't be deceived, this is not Blakey's best, but it is very good. You basically can't go wrong with Art Blakey. His music really swings! I recommended this particular one because it's cheap. I bought it at a going out of business sale for $1.50. I saw it at Border's books for about $6, but the cover was different (If in doubt, this CD has 5 songs and the 5th is a Blakey classic, Moanin'). I warn about the dangers of buying cheap CDs elsewhere (click here) but this is one of the exceptions. There are not notes inside, so I'm not sure who the sidemen are, but if I think it is Hank Mobley on Sax, Freddie Hubbard on Trumpet and Bobby Timmons on piano. Very good stuff and a great price. I have a different Blakey CD on my top 30, but like I said, it's really hard to go wrong with any of his CDs. 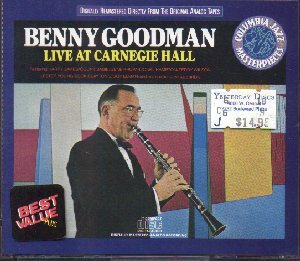 Benny Goodman - Live at Carnegie Hall. (Columbia). Serious, serious swing! Goodman assembled a band for the ages for this gig: Harry James, Lester Young, Johnny Hodges, Cootie Williams, Count Basie, Teddy Wilson, Lionel Hampton, Gene Krupa, and Buck Clayton, amongst others. This 2 CD set features classics, such as "Life goes to the Party", "Stompin' at the Savoy", and an incredible version of "Sing Sing Sing." Excellent solos from Goodman, James, Hampton, Young, and Krupa! Excellent swing. If you like this style of music, there are a lot of places to go. I am not well versed in this style, but I have heard many excellent Big Band samplers, which is an excellent way of getting familiar with songs and artitst. You can learn a lot of big names and get some great music (most of them have the standard classics). 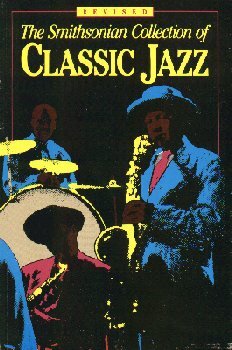 The Smithsonian Collection of Classic Jazz - I have a mixed opinion about this. If you have about $70 burning a hole in your pocket, this 5 CD boxed set is about the best sampler set I have ever seen. It covers jazz from it's beginning to about 1964 (it has a few songs afterward, but fusion, free jazz, and neo-classical is not represented at all). It also has an excellent book included with it that goes over jazz, the musicians represented, and the songs selected. Because of the wide variety of music, it is an excellent sampler. However, I will now get on my stump and voice my rant: This is NOT (let me repeat, this is NOT the official canon of jazz. The Smithsonian asked jazz critic Martin Williams to select what he thought was a representative sample. Having one man select the music was a major mistake on the Smithsonian's part. Because of their name, many schools look at this as some type of "official canon" of jazz. The Smithsonian should have had the wisdom to select a committee, and they CERTAINLY should have had some important musicians, such as Miles Davis, on the panel. I have a low opinion of critics in general. After all, they are paid to criticize and they try to write in such as way as to sound superior. Miles speaks lowly of nearly all critics in his autobiography, and for good reason. A lot of people are resistant to change, critics especially. For instance, Down Beat magazine gave a zero star rating to Charlie Parker's "Now the Time," which is now considered a universal classic. What is my beef with Martin Williams? John Coltrane. John Coltrane is my favorite jazz musician and anybody with a respectable opinion, whether they like him or not, cannot deny that John Coltrane is one of the 10 most important figures in jazz history. He has been the biggest influence on saxophone players since 1960. You can read more about him by clicking on his hyperlink. Williams did not like Coltrane. When Coltrane died, Williams wrote a back-handed tribute to him and with this collection, he dealt Coltrane's legacy a devestating blow. Other important jazz musicians, such as Charlie Parker, Miles Davis, Duke Ellington, and Ornette Coleman are well represented on this collection. Coltrane is represented twice: Once as part of Miles Davis' group on So What and once as a leader on the song Alabama. Now Alabama is a very beautiful piece, but this hardly is representative of Coltrane's work. Coltrane mastered the concepts of playing Hard Bop with his song Giant Steps, which is one of the most important jazz songs EVER, and he also mastered the concepts of modal jazz (of which both songs presented are), and finally, he leant credibility to Free Jazz. To leave Giant Steps off of this collection is nothing short of stupid, in my opinion, and it was also a cheap shot on Williams part, and one that will influence the way future generations view and analyze jazz. There, I've had my rant. While Martin Williams p*ssed me off by dissing Coltrane, I will still give this collection it's due, with respect to the material presented. It is very good and one of the best samplers I have seen, since it covers multiple record labels and is quite thorough. Williams just shouldn't have let his personal bias against John Coltrane put a black eye on an otherwise excellent collection. If you are interested in purchasing this, I would say do so, just be sure to grab the Coltrane CD listed at the top of this page, and if you like it, go explore more of John Coltrane's music. I give tips on buying his music specifically and I have 3 of his CDs listed in my top 30. The Original Jazz Masters Series - (DA Music). This is actually a catch-all. If you don't want to spend $70 for a collection, this is a good way to get a variety of jazz in a 5 disc boxed set for about $25. You can find these at Sam's stores. I have Volume 1.. I have also seen Volume 2, as well as a Big Band set. This isn't full of jazz standards and as many of the legends as the previous set, but it is pretty good. On this one, for instance, there are songs by Louis Armstrong, Thelonious Monk, Miles Davis, Art Tatum, Nat King Cole, Dexter Gordon, Don Byas, Oscar Pettiford, Sonny Stitt, Duke Ellington, Sidney Bichet, Zoot Sims, Ruby Braff, Count Basie, Ben Webster, Teddy Wilson, Freddie Hubbard and more, so it's not chopped liver, by any means. This is a great way to learn a lot of great jazz musicians for a little bit of money.